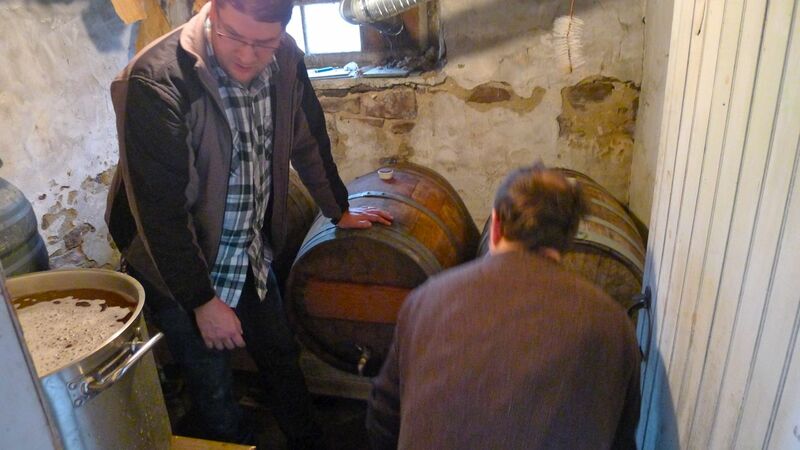 I can hardly believe it’s been over a year since we committed our first batch of Lambic to the barrel. This time, things are a little more intense, as now we need to blend off 1 barrel the first batch of 1 year Lambic, brew Lambic for year two, AND rack off for Kriek to be bottled in another 6 months or so. Ricky and DJ, ready to work. This year’s brew was the biggest yet, at 80g! Or 2.58 BBL to you nano lot out there. Pre boil was nearly 100g. The day got off to a pretty quick start. We’ve been around the block a couple times, and everyone went straight to battle stations at around 9:30am. 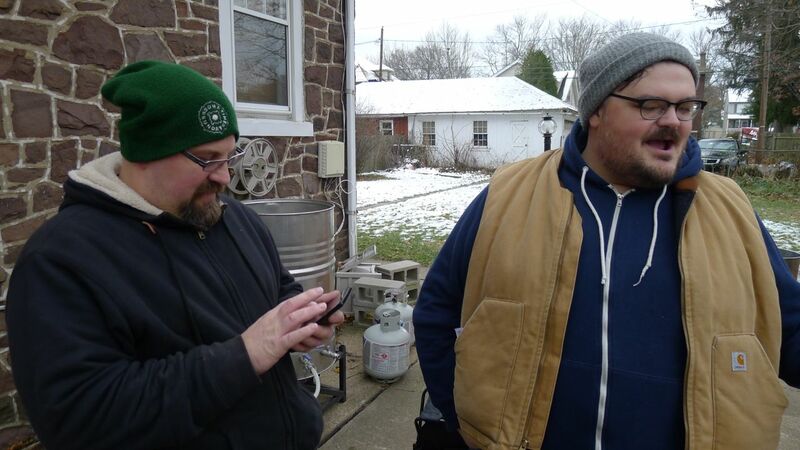 Of course Matt and I needed to go get grain still, and bottles, and hardware, and 1,000 other things, so it took forever, but by the time we got back we were close to strike temp, so it wasn’t time wasted. And we had enough of a breather at the start of mash to scarf down some of Hatchy’s exceptional breakfast casseroles and house roasted coffee. Commish getting the grist in the mash tun. 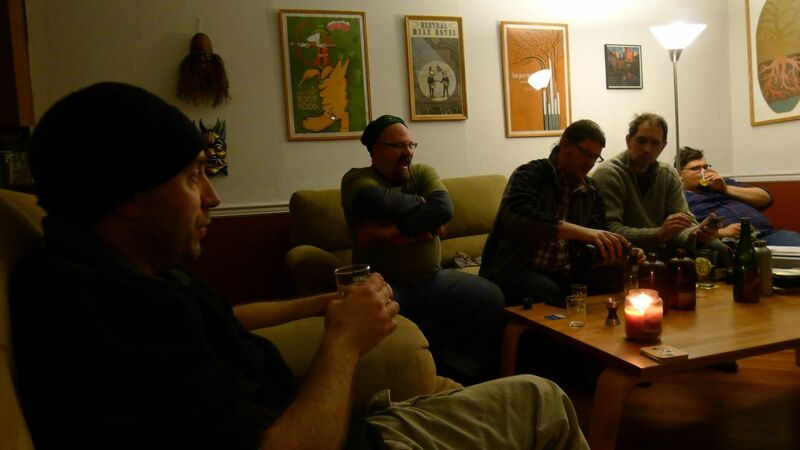 Dough-in went great, hit target temp without much fiddling, so we put it to bed for a bit and had a beer. 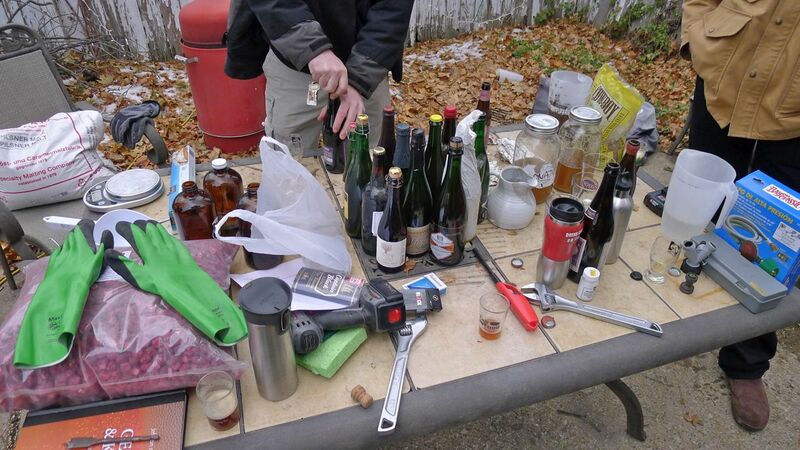 Speaking of beer, I nagged everyone to bring Lambic stuff, so we could collect some nice microbes to help batch 2 along. We started the day with a De Cam Oude Lambiek. 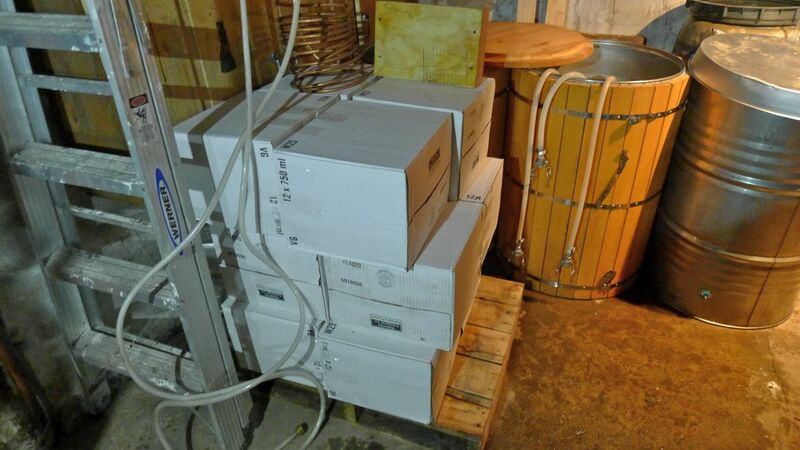 I think over the day we managed to collect microbes from nearly every major Lambic producer. Some beers waiting to be enjoyed. Most of the day went pretty quick, but of course, we had a lot of extra things to do, AND we hit another stuck mash. My apologies to my comrades, who did not build this system, or cut corners on it’s lautering setup. That one’s on me and Commish, but as it was we took the brunt of the suffering. Glad Al decided to bring his gear though, or who knows how we’d have accomplished run off. I think I’m going to invest in a Jaybird false bottom, I can’t take this mess anymore. Commish about to dropkick the mash tun. Once the mash was committed to the kettle, and boil commenced, we got on with the serious business of blending. Blending is tough. Even with only 3 vessels, it’s hard to know you are on the right track. I started by pouring a couple ounces of each to whet everyone’s palate. Then I made a blend using each of the barrels as a leader and the others as equal followers. The differences in these were incredible, and thankfully there was a clear leader in the room. We decided to go for more fruity and bright, with supporting minerality and funk, over a funk bomb with a bit of tartness. 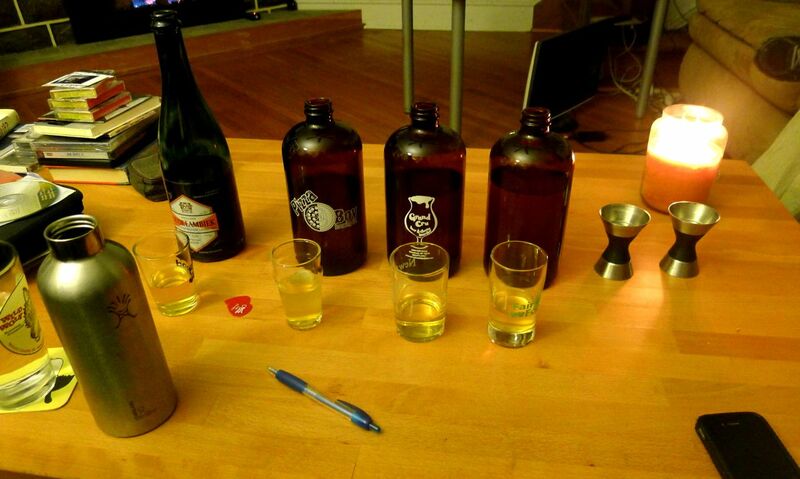 Sampling our three Lambic barrels for blending. The tasting panel at work. 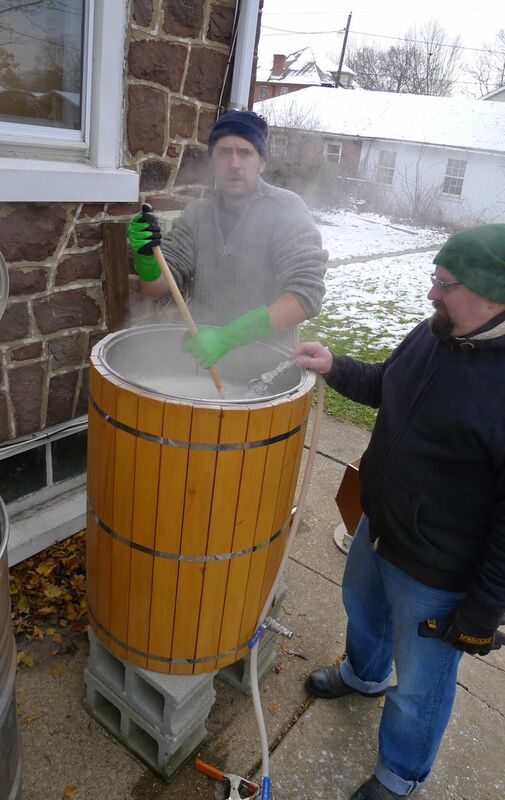 With the blend done, Commish DJ and I went back outside to finish up the boil. I think 80g is just too much for this system, and brewing outdoors in winter months just makes matters worse. Our propane tanks kept freezing over, and the boil was just barely that. We kept shaking tanks to help the flow out, but it was a pain. 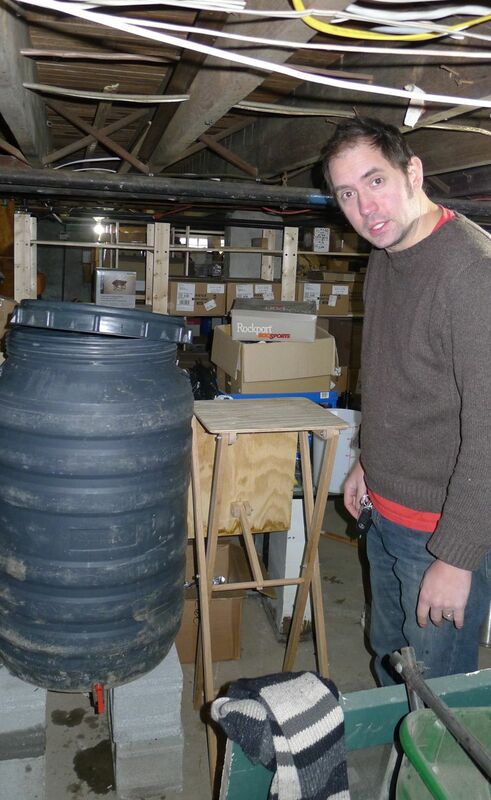 While the boil teetered toward completion, Commish and I set to work converting 2 pickle barrels we had recently acquired into suitable holding vessels for our Lambic and Kriek. They still had some brine to them, and took a few good hot cleanings to render inert. Then we had to put ball valves on them, and a screen for Kriek to hopefully keep most of the cherry must from ending up in the bottle. It was tough work with it being so late and bitter cold. Commish and I working on the blend. Getting started on day 2 was tough. The previous day was a lot of work, and of course we didn’t get near enough sleep. Luckily Hatchy had some excellent breakfast casseroles and coffee waiting for us, so we got off to a good start. A kettle of cooled wort. The kettles had cooled pretty well overnight, but still needed to come down in temp a bit. It will be interesting to see if the wort picks up any additional nuances as a result of it’s extended congress with the Lansdale air. This is our first experiment in overnight cooling, and using a previously used barrel as the main inoculant for a batch this size. The logistics of all of this were one of the interesting challenges of this project. 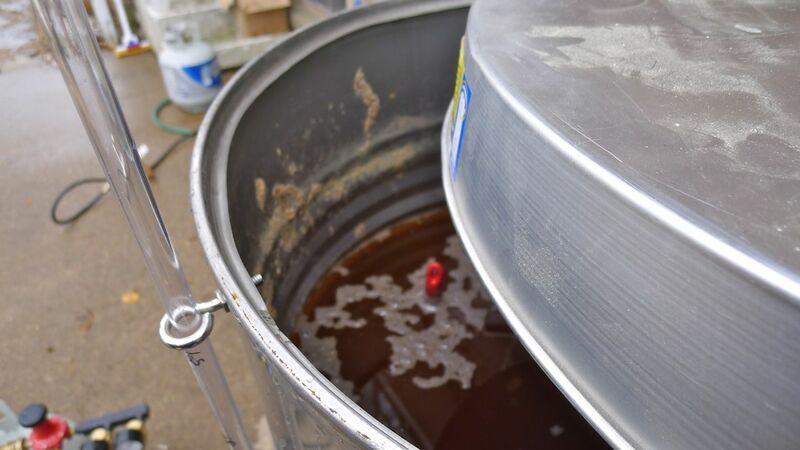 The amount of liquid that had to be move here and there throughout the day was massive for home brewers, and a lot of the methods we’d planned on trying, (like pushing beer with CO2) ultimately failed. 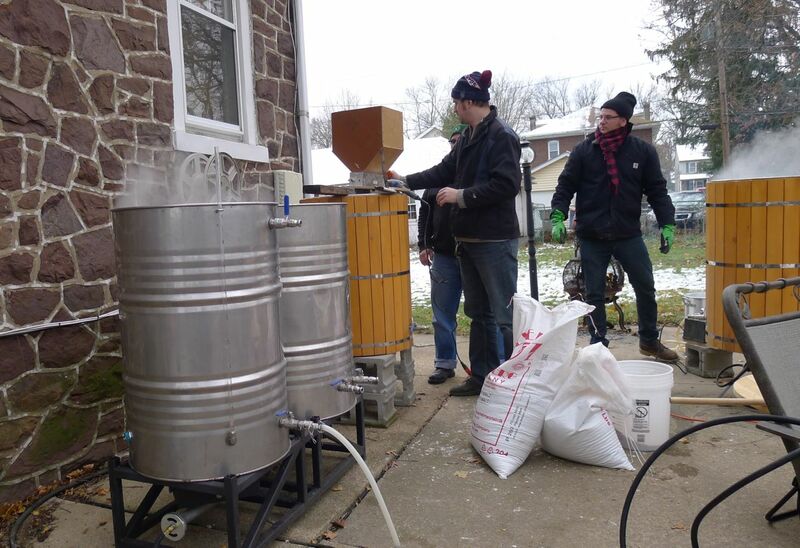 This mostly left us with our traditional tools as homebrewers, buckets and racking canes. Concerned about the affects of over-oxygenation on the “finished” beer, we did quite a lot of flushing with CO2. The last thing we want is for these delicate beers to become sour and acetic bombs over the next few months. There’s a lot of math involved in blending, which is not my strong suit. It’s especially difficult when you need to make multiple blends of different sizes that all need to taste the same. 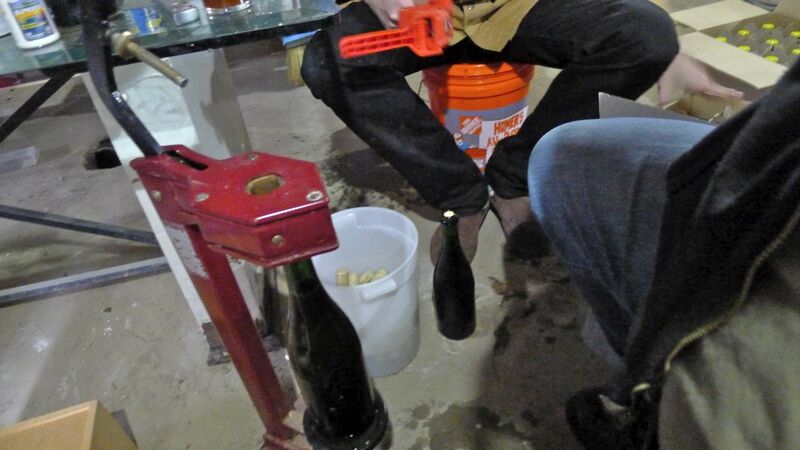 First we did the 25g for Kriek by draining measured amounts from each barrel and carefully racking them into the tank on the waiting cherries. The soak the cherries underwent the night before looked to have almost perfectly reconstituted them. From the looks you could hardly tell the had been freeze dried the evening before. 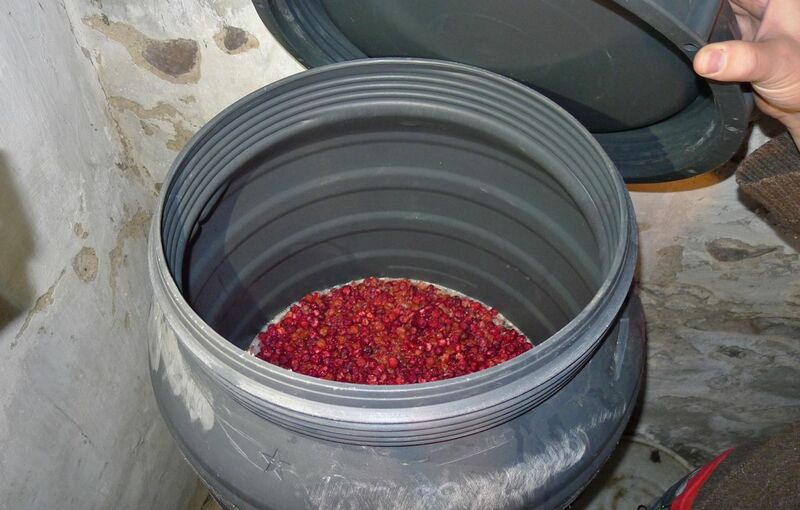 The kriek barrel , ready for it’s second sleep. Once Kriek was set, we needed to rack the straight Lambic. We carried this out in much the same way. I was wishing by the end we’d figured out a way to do it with pumps, but that will have to wait until next year i guess. Once our full blend was done, it was time to rack the beer we brewed the previous day. That meant moving the remaining beer around until we had one completely empty barrel. For this we were able to use the CO2 method which was pretty cool. We got up to about 3lbs of pressure at certain points. It was a bit nerve racking using pressure like that, but after one barrel was full we had the hang of it. It could definitely be higher flow, the 3/8″ tubing made for pretty slow transfers. Pressure racking from barrel to barrel. 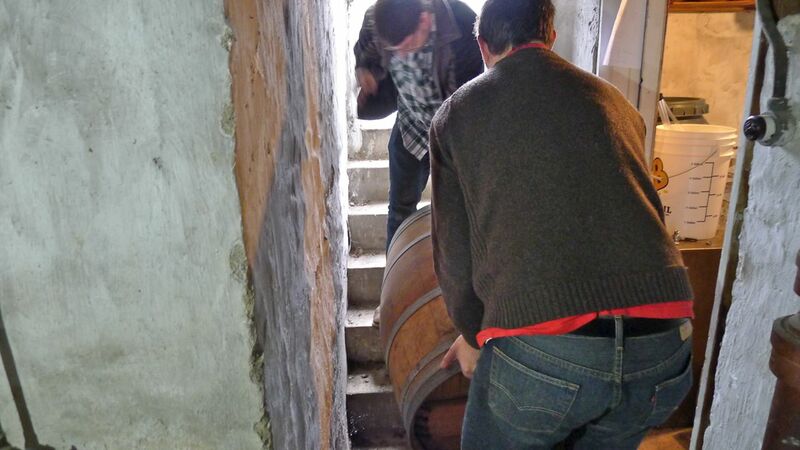 Taking one of the barrels out for a clean. 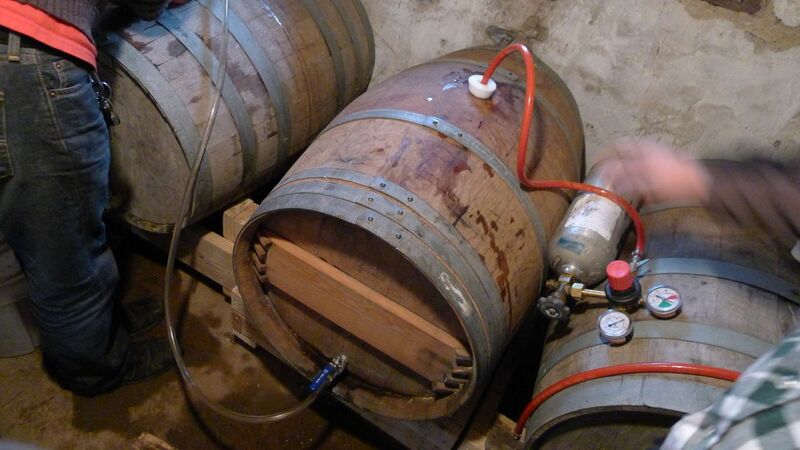 Once we had an empty barrel we went about racking the new beer in. To add to the microbial stew, we dumped in a jar of microbes collected from Lambics drank the previous day, along with a few gallons of beer from year 1. Hopefully this starts a nice vigorous ferment off before too long. Of course, as things go, we were a little short on wort. At least we won’t have too messy a fermentation, but we’ll need to top off in the coming months. Commish readying a barrel for the blend. On to bottling. As with everything the past day and a half, this was a pretty manual process, involving draining a bucket at a time of beer and loading it onto my bottling rig. I had intended to do a trial run of using CO2 to push beer to an automatic shutoff valve, but since the barrels don’t form a tight seal, this was impossible. As it was, though many hands make light work, and with DJ unpacking and sanitizing bottles, me running the bottler, Commish managing the holding tank and passing bottles, and Hatchy and Rich capping, things went pretty quick. We wound up with about a 1/2 pallet of boxes full of beer. Hatchy and Ricky finishing bottles. The plan now is to wait until about summer to start trying bottles. We’ll be looking for the yeast to have fallen totally out of suspension and at least some semblance of carbonation. This being young Lambic we did not add priming sugar. Hopefully they will carb up on their own, but time will tell. I’ve heard of bottles taking a year to carb. We’ll see. We are storing the bottles on their sides, as is Lambic tradition. I’m interested to see what if any affect this has. That’s a lot of work, cash, and planning sitting right there. The Kriek will be checked on pretty soon. It’s had some time since blending and now, and it may be ready for bottling. Of course we’ll need to wait for that to carb up as well. You’d think I’d be antsy with all this waiting, but I know it’s the only way. I just hope our results are good. Either way, it’s been an amazing trip up until now, and we’ve got not plans on stopping. I thought I had missed something,kept on going back to the bottling phase,only to read at the end you had no intention of adding priming sugar. Nervous? Other that the false bottom,how dod you think you can make it easier for next year? Thanks Lee! Yeah, I wanted to test the theory that a properly aged bottled Lambic carries enough sugar in solution, as to not need priming sugar. I figured at the worst it would be “softly” carbonated. As the beer is young still, and can age a long time, even if it’s initially barely carbed, as it transitions to being a bottled oude lambic, around 2 or so years old, that level of carbonation is actually pretty appropriate. We just tried our first bottle the other day. I’m pretty pleased with it. It’s not ready, but it did have a nice light spritz to it. The number one largest challenge in brewing this quantity is heating that much liquid to an actual boil. Something we really only barely achieve, hence the lack of caramelization we’re seeing in the wort. The long time it takes to get to a boil really slows us down, then there’s a real lack of boil-off too, slowing us down even more. We’ve had to adjust our calculators for a 4% boil-off. Pretty pathetic. When you’re doing 3-4 hour boils it’s just a stupid amount of wasted time. That’s the biggest challenge. Somehow between now and next brew day I need to figure that out. I need to learn more about propane combustion and heat so we can burn hotter without freezing the tanks. That or get more people to come out and divide the batch up with us. 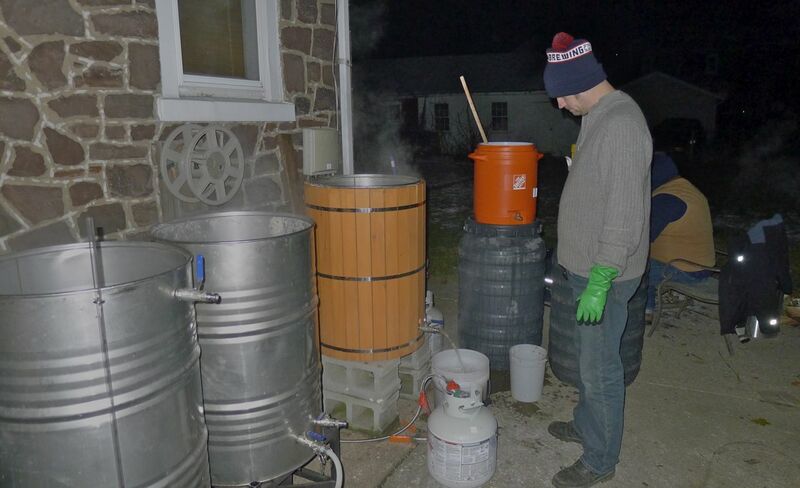 Our first brew had it’s own problems but with 4 teams handling wort production it was pretty efficient. I’ve even thought of heating the kettles with wood. It’d keep us all warm, smell nice, and since we just want a raging boil, heat control would be easy. Of course, that’s all much easier said then done, and our kettles would be all black at the end, haha. I do think buying a serious false bottom will help a lot though, so that’s definitely happening.